Don’t Let Me Slide . . .
OK, I have a Daily Soundtrack option . . . and I have been poor in keeping it up. But today’s a bonus! I cannot give you enough praise for Derek Trucks and his playing. Rolling Stone lists him as one of the three guitarists that will save the guitar in popular music. He’s not on the “hot 100” nor is he interested in being a famous d-bag who ends up on the tabloid covers. 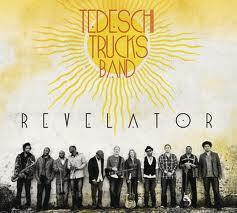 But he’s a family man, married to Susan Tedeschi, and their album, Revelator, is just that . . . a revelation. It’s amazing, and I’ve given you a track already today. This is the opening salvo from the 2-LP set and it’s so good even my 17-year-old daughter was walking around singing it, so . . . enjoy! Stay Loud, Jim Marshall . . . Losing the “Lord of Loud”, Jim Marshall is an end to one of the key pioneers of Rock and Roll. Creator of Marshall amplification, he made amps that were played by Hendrix, Clapton, Jimmy Page, Jeff Beck, Pete Townshend, Stevie Ray Vaughan – just about every musician wanted a Marshall. I even had one at one time, a JTM 45 that fueled a 4×12 cabinet that I wish I had today. This old Cream live performance on the BBC is a perfect example of why Jim Marshall will be missed as Clapton played with his amp turned to “11”. OK, I’ve been so very depressing last couple days…had to put this out there. A great, funny piece that’s just such a true slice of life for anyone who’s ever been single. It’s so simple it’s freaking brilliant! Damn! Hey! HEY! What about me? “Running on Faith” by Eric Clapton, from the album “24 Nights” Copyright 1991, Warner/Duck Records. This phrase has run through my head for the last week. It’s also stuck the song in my head, which years ago I played while gigging in clubs in Omaha. Always liked it, though it has a different meaning to me and the kids now. The Last Thing . . . I wrote this song more than a decade ago. I touched the past in how I met my wife when I wrote it. Never thought the opening lyrics would foreshadow my life. The last lines were actually about Hannah…how hard it was to adjust to having a 2nd child. A friend pointed out it fits my love life as well. Now I’ll never hear this song the same way.